Stoppage Time’s Player of the Year award could only go to one player, a player who surpasses all expectations of him with each and every passing year. It will be no surprise to see that FC Barcelona and Argentina superstar Lionel Messi has won the award in a year in which he may not have achieved as much as usual with his club side (Barcelona ‘only’ won the Copa del Rey in 2012) but in which the man himself has created a piece of footballing history by beating the record for the most number of goals scored in a calendar year. Former FC Bayern München and West Germany international striker Gerd Müller’s record of 85 goals in a calendar year had stood since 1972 but was beaten by a stunning total of 91 goals this year by Messi whose individual exploits continually make people wonder just how much better he can become. Is there a chance that the maestro can become the first centurion in the future? One certainly wouldn’t bet against it and with FC Barcelona already a full nine points ahead of nearest challengers Atlético de Madrid in the 2012-13 La Liga title race, and a remarkable sixteen ahead of defending champions Real Madrid CF, could the ease of the current season help Messi achieve even more greatness in 2013? We certainly can’t wait to find out but, in the meantime, check out each and every one of the 91 goals which he scored in 2012. Due to the Spanish national team’s historic success at the 2012 UEFA European Championship, Stoppage Time’s Coach of the Year award goes to Vicente del Bosque. Having won the FIFA World Cup in South Africa in 2010, del Bosque led his team to European success this year and has helped, more than anybody, to bury the ghost of past Spanish teams who went into major tournaments as favourites but were unable to justify the hype. 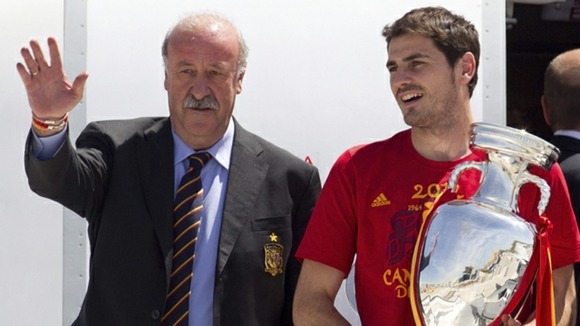 This current generation of Spanish talent had already been helped along by Luis Aragonés when winning the 2008 UEFA European Championship but their place in footballing history has been cemented by del Bosque whose teams have yet to concede a goal in the knockout stages of a major international competition. Vicente del Bosque helped Spain win three consecutive international tournaments and also made personal history by becoming the first coach to have won the UEFA Champions League, which he achieved twice with Real Madrid CF in 2000 and 2002, as well as the two major international titles of UEFA European Championship and FIFA World Cup. A quite remarkable set of achievements which also tie in with Spain’s position as the number one team in the FIFA World Rankings table, del Bosque certainly deserves all the praise he gets and with Spain in pole position in Group I for 2014 FIFA World Cup qualifying there is every possibility that further history could be created in the next eighteen months. Stoppage Time’s Team of the Year award could only really go to one team, namely the Spanish national team following their exploits in Poland and Ukraine in this year’s UEFA European Championships. Having won back-to-back international tournaments, the 2008 European Championship and 2010 FIFA World Cup, Spain were hoping to become the first team ever to win three major tournaments in a row and certainly didn’t disappoint. Following a 1-1 draw against the Italians in their opening group game, Spain defeated the Republic of Ireland and Croatia to set up a quarter-final against France. A brace from Xabi Alonso helped secure a 2-0 win over the French but Spain, following a tough goalless draw against Portugal in the semi-finals, needed the lottery of a penalty shoot-out to progress to the final. Meeting up against old foes and group opponents Italy again in the final, many expected the game to be a hard slog but Spain had other ideas and went on to win their third European crown in style with goals from David Silva, Jordi Alba, Fernando Torres and Juan Mata securing a 4-0 win and a place in footballing history. Stoppage Time – International Football Blog is pleased to announce its award winners in four categories and the winners will probably not come as a shock to anybody. Nevertheless it is good to be able to celebrate the wonders of the past footballing year and 2012 has been a pretty special year. The first category is for the Goal of the Year award and there were a couple of major contenders. However, one goal stood out above all others just for the technicality and the sheer splendor with which it was scored. Step up Sweden’s Zlatan Ibrahimović who secured a 4-2 victory in an international friendly match against England in November with this audacious effort. The recent European dominance in the FIFA Club World Cup came to an end today in Japan’s second city of Yokohama as Copa Libertadores champions Corinthians became world champions for the second time with a narrow 1-0 defeat of UEFA Champions League holders Chelsea FC in a final which will hardly go down as a classic but which for followers of O Timão will go down as another chapter in their famous history. Since fellow Brazilian club Internacional of Porto Alegre won the 2006 version of the FIFA Club World Cup, South American teams had struggled in this competition with European champion clubs winning the previous five tournaments in a row including two victories for FC Barcelona (2009, 2011) and one each for AC Milan (2007), Manchester United (2008) and Internazionale (2010). Corinthians’ victory in today’s final broke the dominance and added to Brazilian football’s wonderful history in this tournament with four title wins comparing to their South American neighbours, no other nation from that particular continent providing a winner of this tournament since it changed its format in 2005. Corinthians had won the inaugural version of this event in 2000 when a dour final, played against compatriots Vasco da Gama, was decided by a penalty shoot-out following 120 minutes of goalless action. The second title win will perhaps be more celebrated due to the fact that Chelsea FC went into the game as most pundits’ favourites to win the title. Chelsea had qualified for the final with an easy 3-1 win over North and Central American champions Monterrey CF whilst Corinthians had to work harder to overcome the challenge of African champions Al-Ahly in a semi-final which was decided by a single goal from the Brazilians’ Paolo Guerrero, whose presence would ultimately also prove influential in the final. With twenty minutes remaining, and the game stuck at 0-0, the deadlock was finally broken when Guerrero took advantage of some confused Chelsea defending to head home from close range and spark a mass frenzy of celebration amongst the Corinthians supporters, up to 30,000 of whom are said to have made the journey to Japan to transport the spirit of their São Paulo home Pacaembu stadium to FIFA’s showpiece event. For interim Chelsea coach Rafael Benítez, the winning coach when Internazionale won the title in 2010, today’s final was a bitter disappointment and there is no doubt that those fans who have failed to warm to him will use this as a stick to beat him with. For Corinthians’ coach Tite, however, legendary status is now assured. Having taken over the coaching role in 2010, Tite led the Paulista club to their fifth Campeonato Brasiliero title in 2011 before sealing the club’s first ever Copa Libertadores title this year following a 3-1 aggregate win over six-time South American champions Boca Juniors. With the world title now in the trophy cabinet it is fair to say that Tite will bask in the celebrations as much as those fans who travelled all that way to see their team triumph in Japan.